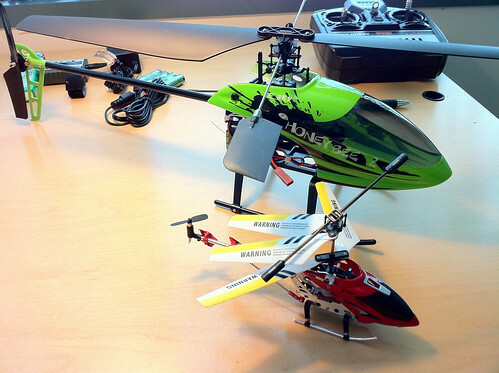 The Self-Confessed Geek: Adventure in RC Helicopters: Honey Bee V2 FP Arrives! Adventure in RC Helicopters: Honey Bee V2 FP Arrives! Very excited as my new Honey Bee V2 helicopter arrived via UPS this morning - of course I was in the shower. I opened the box and checked everything was there and undamaged - excitement rises! But then I encounter my first problem: I plug the Li-Po battery into the E-sky charger and both LEDs just keep flashing. According to the information on the charger this means “battery goes wrong” (another example of Google Translation at work?) which I assume means that there’s something wrong with the battery. I get in touch with xheli.com via their chat feature on their site and 'George' says he’s sending me a new charger - I don’t understand why when the badly translated lights indicate that it’s probably a fault with the battery but what do I know? A little digging around reveals that the software is actually freeware and it needs a ‘virtual com port’ to work. The solution the site describes doesn’t seem to work. I find another program called VSPE - that says I need to pay $25 for the 64bit port of the ‘free’ program but it does seem to work without me hitting my credit card again. Then FMS hits another problem “D3DRM.dll is not downloaded”. Back to the forum. I finally find the missing dll and place it in the FMS directory. Finally I get the program to work. I download and install a model of the Honey Bee V2 and calibrate my transmitter for use with the program (for the record, it must be switched on to work. Finally I ready to fly but I’m out of time. A frustrating first experience - at least the helicopter looks good sitting on my desk.